Bayani Fernando is Using Adwords, While doing blog hoping today I have seen that Bayani Fernando is now using Google Adwords in his political campaign, I have seen Barack Obama using this technique and winning the game. So will Bayani Fernando win the race to Malacanang ? Do we see Noy-Noy and Manny Villar doing the same in the near future when their limit to television ads will be completed ? And for sure Google Adwords is cheaper than television ads. He is actually promoting his facebook account. If I were him, I will direct the ads to the list of my accomplishments and Political platform. A picture of changes of Manila from crowded manila to a more discipline people. This is just my opinion. This politician should hire an internet campaign manager. A lot of this 2010 elections candidates are using the power of online advertising and social media. 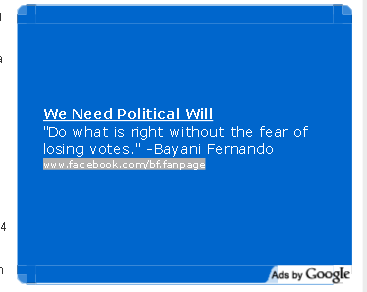 As early as December last year, I have seen ads of politicians in Adwords and Facebook advertising. I also noticed Gibo Teodoro advertising in yahoo. I remember I guess 1 straight week that his ads were at the top of my yahoo inbox. They have hired online consulting firms/experts to leverage on the power of the internet. Sorry pero di ko pa na encounter yung ganyang problem.. Check mo yung country baka naka set sa US. I interviewed his team before. Looks like they have different objectives depending on area. Maybe they have a diff strategy in Saudi. I have seen heavy BF Facebook ads in the Philippines leading to his FB account as well. FB is being used by media as benchmark of winnability in the country. Sad truth probably headed by the Villar camp who is spending millions on FB alone. “FB is being used by media as benchmark of winnability in the country. ” Tssskk I just hope that Voters will be intelligent enough to know the right person for that post. and not rely on Ads even in net and in television. Grabe po ang ads ni Villar using google adwords. ^_^ I see them very often kasi. BTW what happen on your adsense ads.. bakit wala na sa Blog mo ? I think Bayani should do the same. Adwords is freakishly expensive. He could go broke in no time. The use of Facebook ads is much more cheaper and targeted! I am not seeing it here in Saudi Arabia, MAybe their ads in facebook is targeted to Philippines only..
Good for you that you notice this…well i guess during this season of political campaigns, politicians would do anything to get that vote. You have such great blogs Dexter, you inspire me! Keep it up!